Protecting your property is one of our core values. 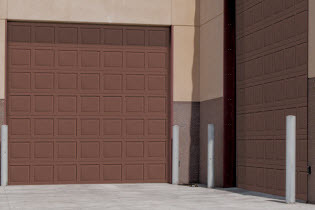 When you add wind load options to your commercial or industrial overhead door, you also get peace of mind during times of high winds from hurricanes and extreme conditions. The following commercial collections are available with standard and extended wind load options. Talk to your local Ribbon Distributor about your needs or for suggestions about a wind resistant door that offers the highest level of protection in your geographic region. 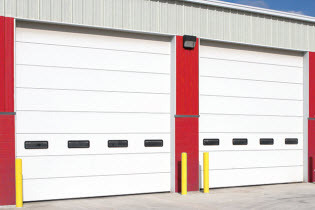 Thermacore® is the premier line of insulated sectional steel doors available today. It is an ideal choice for applications that demand the highest levels of thermal efficiency, air infiltration and wind load resistance. The Thermacore® sectional door model 515 and model 525 are engineered to withstand higher design pressure than our other Thermacore® models. Wind Load and impact-resistant, the Thermacore Model 515 features 3-layer construction of steel-polyurethane-steel and an R-value of 12.12 for extra strength and thermal efficiency. With an R-value of 16.22 and 3-layer construction of steel-polyurethane-steel, the Thermacore Model 525 is one of the most thermally efficient options for applications located where wind load and impact resistance is required. In order to provide the correct door solution, we need to understand the Architect/Contractor to Door Supplier/Manufacturer Relationship. Specifications can often times be found on the Building Specification Page. On the structural specification page for a building, the structural engineer lists all of the wind load factors, as well as the pressure loads for the different parts of the structure, including the doors.